In our case, it will be used as an access point for demo SIP telephones. This section describes the installation of Debian Linux. We choose to install the system on a normal computer with a compactflash <-> IDE adapter, and then transfer the compactflash card in the Alix computer. There is no difference between doing so and installing on a normal hard disk drive. The installer will guide you through the process. Settings that are kept to default values or logical (country selection, keymap choice, etc.) are not described in this howto. Use the compactflash <-> IDE adapter to plug the compactflash card in a normal computer. Plug it in the "primary IDE slot". Do not forget to also plug the power connector (same as for a floppy). Insert the Debian installation CD and start the installation process. For partitioning, choose Manual. Delete existing partitions, and then create a new partition using all the available space. Use default settings (Ext3 file system, mount point /, etc.). The installer will complain of the lack of swap partition (disk space that can be used as RAM). We do not want swap on a compactflash because it could quickly damage the card (on a compactflash card, the number of write cycles to a sector is limited. Confirm we do not want swap. At the Software selection screen of the installer, you can choose which package sets you want to install. As we want a minimal set of packages, select only Standard system. When the installation is finished, reboot on the new system. 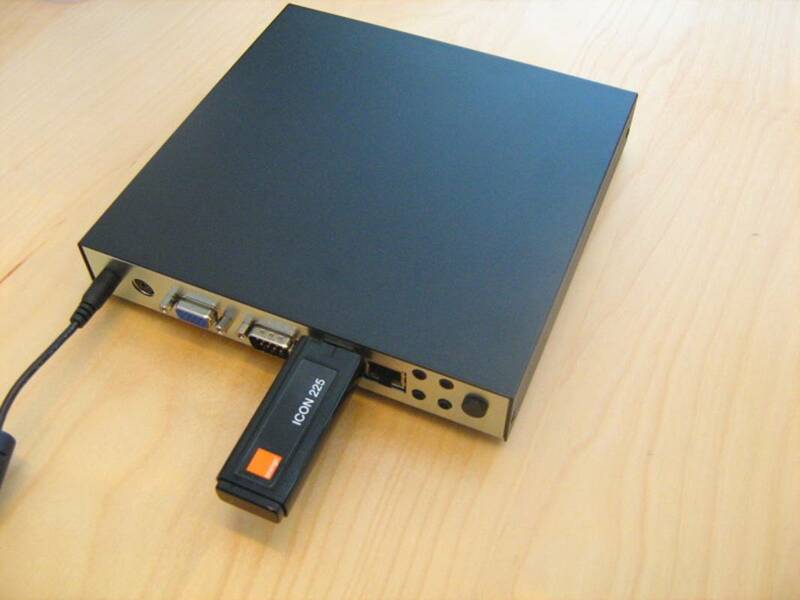 Remove the compactflash card from the computer, and plug it into the Alix box. It should boot without problems. Save the files in a directory on the computer (here /root/081001-orange-umts-install/). At this point, plug the USB stick. [ 1382.351896] usb 1-3: Manufacturer: Option N.V.
[ 1382.895992] USB Mass Storage support registered. It is for now recognized as a CD-ROM device. We need the usb_modeswitch program to change the operating mode to UMTS adapter. [ 1757.984837] usb 1-3: Manufacturer: Option N.V. The next step is to connect to the access point (here Orange). We have to modify some parts of the connect.sh script. PIP="`grep '^_OWANDATA' $TMPFIL | cut -d, -f2`"
NS1="`grep '^_OWANDATA' $TMPFIL | cut -d, -f4`"
NS2="`grep '^_OWANDATA' $TMPFIL | cut -d, -f5`"
The following commands are sufficient to setup a simple NAT. It will forward and translate the address of packets coming from interface eth0 (the wired interface) to interface hso0 (the UMTS stick). For convenience, we install a DHCP and DNS server on our UMTS gateway. This will allow simply plugging a SIP telephone to our UMTS gateway and having it working. For the DNS server we keep the default configuration without modifications. It will act as a caching server, relaying requests to the default DNS servers (obtained from Orange through DHCP, visible in /etc/resolv.conf). To avoid damaging the compactflash card too quickly (write cycles are limited), we will keep the logs in RAM, and write them to the flash only at shutdown. For this we create a RAM file system (tmpfs) mounted at /var/log and add an init script to copy the contents at startup/shutdown. The same is done for directories /var/tmp, but here we do not keep the contents. echo "Copying /var/log contents to ramdisk"
echo "Copying /var/log contents to disk"
Now we must add the script in the correct order in the boot/shutdown sequence. See http://www.debian-administration.org/articles/212 for description of the runlevels. We add it for start at sequence 37 in the S runlevel to launch it as soon as possible in the boot sequence (after the partitions are mounted). For the shutdown/reboot, we add it with sequence 99 to execute last. It is probably not the right way to do, but works fine for our usage. update-rc.d ramfs-log.sh start 37 S . stop 99 0 1 6 . The system will now automatically copy the logs at boot/shutdown/reboot. Remark: We choose position 37 of the S runlevel because file systems are mounted at positions 35 to 37. This can be different depending on the Linux distribution, etc. This can be caused by udev renaming the Ethernet interface (e.g. eth1 instead of eth0), because of the MAC address change. To correct this, remove udev net persistent rules and reboot the computer. Using an existing adapter allows easy unplugging/plugging of the adapter and monitor, without risking to mix the pins and break something.